UNICEF continues to support the current emergency response efforts to affected communities in Makira province with the provision of education, water and hygiene supplies, following the 7.8 magnitude earthquake in early December 2016. These supplies are sufficient to meet the needs of 12,500 people and include 3000 pieces of hand washing soaps, 5000 water containers, two cartons of Information, Education and Communication (IEC) materials carrying messages on hygiene practices, 12 tents and tarpaulins for affected schools. In addition, radio spots promoting the preparation and storage of safe drinking water, safe food storage, and appropriate sanitation practices are scheduled for broadcast on Solomon Islands Broadcasting Corporation and will also be shared via mobile phones. 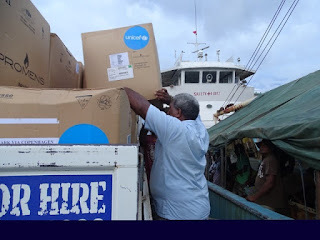 “We are pleased to provide these emergency supplies as they are crucial for families especially children in order to stay healthy, as the risk of getting sick due to diarrhoea is common and usually experienced in disasters,” said Chief of UNICEF Solomon Islands Field Office Yun Jong Kang. “The soaps, water containers and buckets will encourage families to practice constant handwashing and ease the burden of carrying and storing water. Health and hygiene IEC brochures and flip charts will be used by health workers, volunteers and parents to encourage hygiene behaviours in the home and around the communities. “An increase in the number of diarrhoea and red eye cases was noted in the affected areas and therefore these IEC materials will help families stay healthy,” explained Mr Kang. 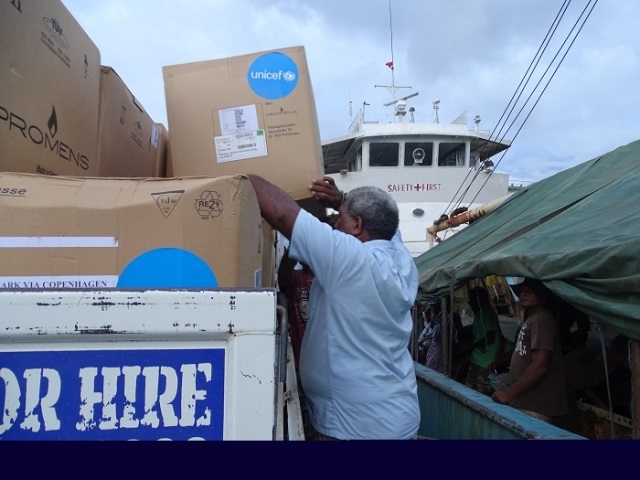 Mr Kang assured that UNICEF Solomon Islands Field Office will continue to work closely with the National Disaster Operations Centre (NDOC) committees that are responsible for coordinating response at the national level mainly in Health, Education and Protection throughout the response phase. The supplies will be distributed by Solomon Islands Red Cross health and hygiene promotion volunteers and in close collaboration with Makira Provincial Emergency Operation Centre (PEOC).